POOLE, FOSTER & DUL, An Accountancy Corporation is a California CPA firm that provides accounting, tax and business advisory services to businesses and individuals. We deliver the expertise and experience of the large accounting firms but we tailor our services to meet each clientï؟½s specific needs and goals. 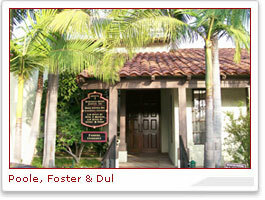 Poole, Foster & Dul was established in 1964. We have over a century of combined experience in meeting the accounting and tax needs of clients in many varied industries. We recognize that our most important product is prompt and effective service of the highest quality. All our efforts are directed toward achieving that aim. We believe we can provide you services that meet your needs.